One of the nation’s most listened-to spoken word radio stations, both on the radio and online, desired a new robust App for both Apple and Android devices. When all was said and done, this top-rated Hubbard Radio station worked with jācapps to get the job done. The station is all-News WTOP-FM, which airs on a network of signals blanketing the Washington, D.C. DMA. On Monday (11/20), just in time for the busy Thanksgiving holiday travel period, the new WTOP App was launched. 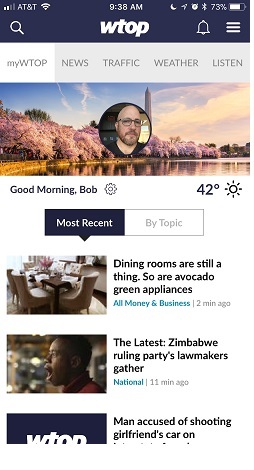 The app offers many custom features, including personalized news feeds based on a user’s interests, custom breaking news and traffic alerts, and weather targeted to the user’s location. The answer was, in addition to offering the latest news, traffic and weather, an app that is fast, organized and easy to use. “They wanted something that people will want to make a part of their daily news routines,” Zielger notes. The App saw a developmental partnership between WTOP and jācapps. The results include a traffic section offering a current incident and conditions map powered by Google Maps and the WTOP Traffic Center, up-to-the-minute Metro incidents and delays, access to the @WTOPtraffic Twitter feed, and the ability for a user to report a traffic incident via phone, Twitter, voice memo or email. Listening features include the ability to listen live to WTOP Radio, hear the latest traffic report on-demand, listen live to major press conferences and other news events, and to download podcasts from the WTOP Podcast Center. Other benefits include the ability to save and share important news articles, set an alarm to “Wake Up to WTOP,” submit photos, video and audio to the WTOP newsroom, and view hourly and 10-day forecasts.